Orphaned by a gnoll attack on a city of pilgrims, a starving young Seelah was fascinated by a paladin's shining helm. After her theft of the helm led to the paladin's death while defending the city, the guilt-stricken girl climbed onto the paladin's pyre—only to be saved by the other paladins, who took her in and made her one of them. During Combat Seelah is fearless, especially in the face of evil, and she faces fiends, undead, and those with malicious intent head-on. Against particularly powerful evil foes—especially fiends and evil dragons—she channels her goddess's power into her attacks with her smite evil ability. If she has already expended her daily uses of smite evil, she uses her divine bond to increase her weapon's power. When her allies are injured or in trouble, Seelah puts herself in harm's way in an effort to heal them. Seelah faced numerous tragedies in her young life. The loss of her home brought her family to the city of Solku in Katapesh, and there she lost her family to gnoll raids. At 14, she was orphaned and poor on the streets of a strange town, doing what she had to in order to survive—stealing, mugging, conning travelers, even attempting to make her way as a young mercenary. Eventually, a band of Iomedaean paladins came to Solku to help defend it against the gnoll hordes. Immediately enamoured with the shinning steel of the foreign defenders, Seelah stole one of their helmets, a great helm emblazoned with the image of a golden bird. During the Battle of Red Hail, however, Seelah realized that one of the bravest knights, a woman named Acemi, fought the battle without her helm. While holding Solku's gates, the knight took a mortal wound to the skull, winning the day but dying of her wound that evening. Wracked with guilt, Seelah approached Acemi's body as her companions prepared her pyre. They watched silently as Seelah placed the stolen helm over the dead woman's head, and then climbed onto the pyre aside her. The paladins were moved; they had known from the start that Seelah had stolen the helm, but Acemi had forbidden them from collecting it, hoping the helm would win the desperate orphan coin enough for a few meals. The knights of Iomedae took Seelah in that night. Although she has come to terms with Acemi's death, Seelah still regrets the theft that ironically brought her into Iomedae's arms. She originally came to Iomedae out of guilt, but as the years passed, that guilt has transformed into a powerful love and faith in her goddess. 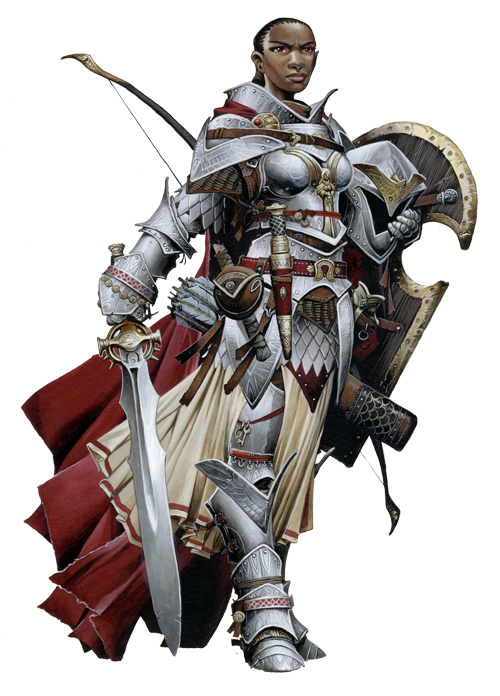 The young paladin wears her hair in Acemi's style and trains relentlessly in the use of the longsword. In so doing, she hopes to carry on the good work that Acemi might have done had she not fallen at the Battle of Red Hail. It's the least she feels she can do to make up for a death that she caused.